Once you start making your own meat pies, you will realise how totally different they taste to shop-bought pies and will probably swear that never again will you buy one. 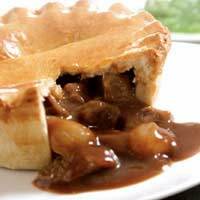 You know what has gone into your pie, it’s been made with pride and care, the smell of home-baking has wafted through to tantalise and tempt and the finished product...the stuff that dreams are made of. Prepare the meat by trimming any excess fat from it then chop the kidneys into slivers and cut the steak into cubes (about 2.5cm is a reasonable size.) Toss all the meat in seasoned flour on a plate. Heat the oil with 50g of butter and fry the meat until it is browned all over-do this at a high temperature. Add the rest of the seasoned flour to coat the meat even more as it browns. Place the meat and flour mixture in a casserole dish. Clean the pan and melt the rest of the butter to fry the onions in until they are soft but not browned. Add the mushrooms and garlic. Fry these ingredients together for about 3 minutes. Now, pour the stock and wine into the pan with the onions and mushrooms. Bring the liquid to the boil then pour it all over the meat in the casserole dish and cover with a lid before cooking in a preheated oven (160C) for about 2 hours. With a slotted spoon, lift all the meat from the casserole dish and put it in a pie dish. Place a pie funnel in the centre (this stops the centre of the pie collapsing.) Heat the liquid from the casserole on the hob and boil briskly until it has reduced by about half, then, pour this over the meat and leave it to cool. Roll out the pastry dough-up to about 0.5cm-on a lightly floured surface and lift it with the rolling pin to cover the pie contents, making sure the pastry fits snugly and there are no gaps. Trim the overlapping pastry and use it to make pastry leaves-decorate the top of the pie with these. Brush the pastry lid with beaten egg and then bake in a preheated oven (220C) for about 30 minutes. The pastry should be a an appetizing golden colour, but, if it starts to look too brown, cover it loosely with foil for the last few minutes. This is a great way of using left-over meat to create a completely different meal. You could try other combinations, depending on what left-over meats you have. Pork and apricot goes well, as does chicken and leek. Gently fry the sliced onion in a little olive oil to soften the onions. Add the cored, peeled and sliced cooking apples and fry for a couple of minutes then remove from the heat. Mince the meats and arrange them in layers, with the onions and apples, in a buttered ovenproof pie dish. Sprinkle each layer with salt and pepper and a pinch of both rosemary and sage. Heat the stock and stir in the tomato puree, then, pour this liquid over the layers in the pie dish. Roll out the prepared pastry then cover the pie with it. Use the trimmings to make decorations for the top of the pie and cut an air vent, about 1.2cm long, in the middle of the pie so that steam can escape. Brush the pastry with beaten egg and cook in a preheated oven (220C) for 10 minutes, then reduce the heat to 180C and cook for a further 25 minutes. Meat pies can be made without too much fuss and are a great way of using up leftovers. For something special, braise beef in ale before filling the pie with it. Always check that meat is tender before progressing to the next stage in pie-making. It is much easier to cook the meat for a little longer-and have a tender pie filling-than to serve a perfect-looking pie with tough meat inside!